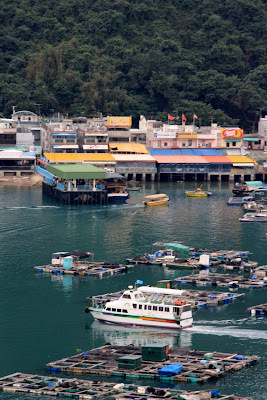 Lamma Island is about 30 minutes in a ferry from Central Pier No 4 on Hong Kong Island, but about a thousand years away in terms of its vibe. There's nothing frenetic, noisy or crowded about it, and it has great beaches. There are no cars, just lots of fishing boats and waterfront restaurants. And space - a surprising amount of untouched space. 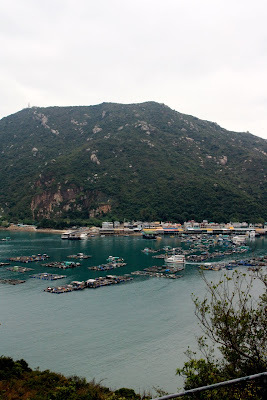 After a bracing walk up and over the middle of the island we walked along the main pier of Sok Kwu Wan village, looking at all the fascinating seafood in the restaurant tanks - fresh garoupa, huge squid, prawns and giant razor clams. 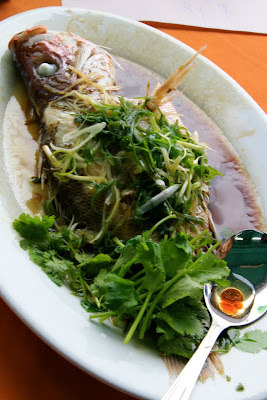 We settled in to the Peach Garden Restaurant and ordered a whole steamed snapper, with a ginger, coriander, soy and sesame oil sauce. And as enticing as that eyeball looks, I didn't eat it.